Nelson Tower at 450 Seventh Ave offers stunning panoramic views view of Manhattan, Queens, Brooklyn, and New Jersey, and contains a variety of contemporary NYC office space options for companies of all sizes. A convenient Penn Station location and state-of-the-art communication infrastructure make this a great site for your business. Check out our available office space today. Our property offers an inspiring environment with a little bit of everything you’d ever need in NYC. A renovated front lobby gives the offices an elegant feel, and office workers can access the building 24/7. 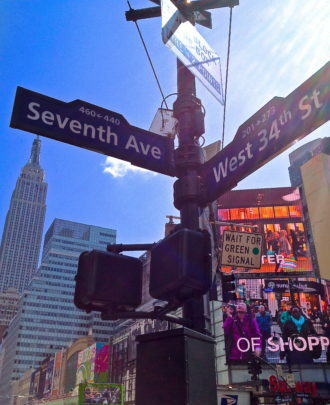 We are convenient to all major subway lines, Penn Station, Port Authority, and Grand Central. Located between W 35th and W 34th St in Midtown, your future office is a middle ground between Penn Station, Herald Square, and 42nd St.
450 7th Ave is steps away from a variety of hotels, restaurants, retail stores, and other essentials such as banks, the post office, and Starbucks. You can find more detailed information on our location map.